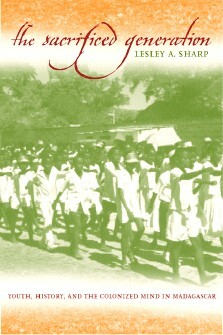 The sacrificed generation : youth, history, and the colonized mind in Madagascar / Lesley A. Sharp. - Berkeley : University of California press, 2002. - XV-377 p. : ill., maps ; 24 cm. NOTE DE L'ÉDITEUR : Youth and identity politics figure prominently in this provocative study of personal and collective memory in Madagascar. A deeply nuanced ethnography of historical consciousness, it challenges many cross-cultural investigations of youth, for its key actors are not adults but schoolchildren. Lesley Sharp refutes dominant assumptions that African children are the helpless victims of postcolonial crises, incapable of organized, sustained collective thought or action. She insists instead on the political agency of Malagasy youth who, as they decipher their current predicament, offer potent, historicized critiques of colonial violence, nationalist resistance, foreign mass media, and schoolyard survival. Sharp asserts that autobiography and national history are inextricably linked and therefore must be read in tandem, a process that exposes how political consciousness is forged in the classroom, within the home, and on the street in Madagascar.